Valaikappu in Tamil language means "Bangle Ceremony"
This ceremony 'Valaikappu' is usually held in the seventh or ninth month of the first pregnancy, wherein the pregnant women is presented with new sets of glass bangles. The scientific reason is that the sound of these bangles is supposed to reach the little one inside the womb. Usual tradition is that the woman's mother-in-law or sister-in-law leads her to the temple and to a bangle shop where she selects the bangles of her choice. Some families arrange to get the bangle-seller to their houses and the purchase of the bangles is a part of the ritual. During the ceremony the pregnant lady seeks the blessings of the elders after putting on the bangles, prayers are invoked for the well being of the mother-to-be and the foetus. Priests are not involved in this ritual. Now lets see one such valaikappu ritual that happened on Sunday the 3rd August 08. The mother-to-be is Subha, my cousin (Mother's Sister's Daughter). My blog post of her wedding is here. The new camera phone K790i of mine had done a very good job in catching the moments at the valaikappu function. I am sure that you will enjoy my photographs. My cousin Subha and her husband Hari Prakash. Bangles are being adorned to Subha. Each ladies take their turn to perform the Nalungu during which they apply sandal paste to the mother-to-be and wishes her for a healthier motherhood. 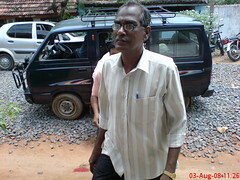 My Daddy entering the venue. 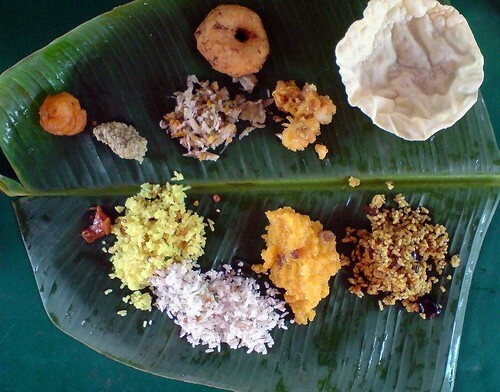 The tradition is that the parents of the lady will be presenting the delicious 5 variety of food. That is what you see in the above pic. Each of the five tastes kindles the taste buds at different spots in your tounge. I hear you asking "Hey only four varieties are there in the plantain leaf, where is the fifth one? Yes its the curd rice, and it will be served at the end of the lunch. 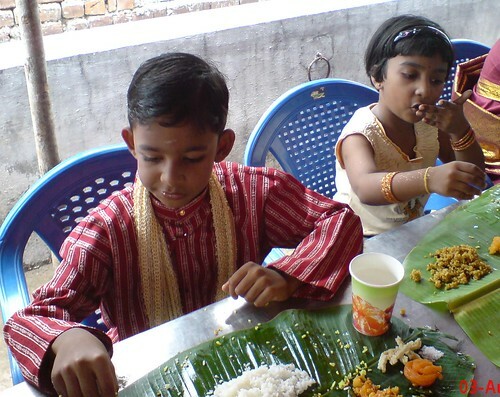 The little ones enjoying the lunch. 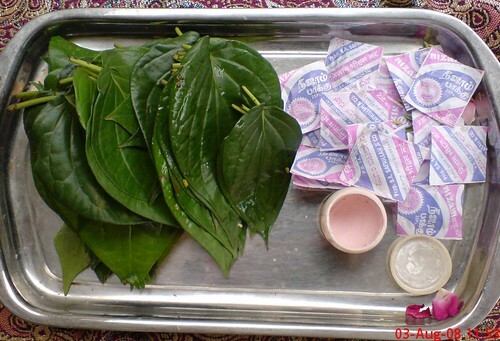 Betel leaf, Betel nut and caustic lime completes the festive food .